"We shall never learn to know ourselves except by endeavoring to know God; for, beholding His greatness, we realize our own littleness; His purity shows us our foulness; and by meditating upon His humility we find how very far we are from being humble." It is hard to believe that we are more than halfway through October. We are so blessed to have great volunteers at our school. Much gratitude goes out to our social committee for the wonderful wine-tasting event last weekend. We had a great turn-out and the evening was full of great fun, food and fellowship (as well as great wine!). Michele Robbins, Eileen Bliss and Heater Terreri out-did themselves! And thank you to all who attended the event. On October 26 we will enjoy our annual Trunk-or-Treat. This has become a great tradition and look forward to another great evening of fun. The week of November 11 we will celebrate Discover Catholic Schools Week. That Friday, November 16, we will have an open house at 9:00 am to include some light refreshments, a Q and A and a tour of the school. Please help spread the word to friends and neighbors about our gem of a school! Where in the World is Fr. Hinkle? St. Ambrose school students from grades Pre K to 8 will be sending letters, drawings and words of encouragement to sailors aboard the USS Stennis this year as part of a service project recognizing men and women in uniform. Students are encouraged to write and decorate as many notes as they would like. These notes will be sent to Fr. 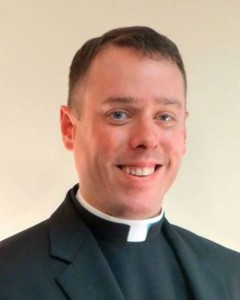 Jim Hinkle, former parishioner of St. Ambrose and recently the parochial vicar at St. Theresa in Ashburn, who reentered the Navy in July as a Lieutenant in the Chaplain Corps; he currently is serving as the sole Catholic Chaplain embarked on the USS Stennis. 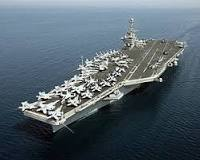 The aircraft carrier strike group will begin its deployment from its current homeport of Bremerton, Washington. The 8th grade Leadership and Service club explained the program to all the grades after Mass on Thursday, October 11 and will be collecting letters and drawings on Friday, November 2. Please encourage your children to work on this at home as well as at school. We're selling eco-friendly tote bags, travel bags, kitchenwar e & more through Mixed Bag Designs. By now you should have received the catalog and new gift assortment flyer. For more information on the fundraiser, check out this flyer. Join us on Friday, October 26th 6:30-8pm for St. Ambrose's 4th Annual Trunk or Treat! For more information about this fun filled event, check out this flyer. To sign up to decorate your trunk, go to https://tinyurl.com/tORTStA. The Scholastic Fall Book Fair is coming to the library in November. Thursday (11/1) - The students make a wish list. This is an exciting time in the library for the students and the teachers. Be sure to come in and take a look at the books your student is interested in reading. It's a great way to support the library program and get a head start on holiday shopping. Our ANNUAL COAT AND WINTER WEAR DRIVE will run from 1 November through 30 November. Please start thinking about cleaning those coats and winter wear that your family will no longer be wearing. We again ask you to donate only washed or dry-cleaned items which you would have your own family wear. We love to get brand new items as well! Contributions from St. Ambrose School have been wonderful in the past years, so let's make it another very successful drive to help those in need. Join Curious D olores in her Journey to the Rainforest! Dolores lives on a small Texas ranch during the Great Depression and dreams of becoming an astronomer. When her aunt Ynés Mexia, the pioneer Mexican-American botanist, comes for a visit and talks about her trek through the lush Amazon region of South America in search of new plant specimens, she inspires Dolores to pursue her dreams against family expectations. "Between Earth and Sky", states playwright Cackley, "was inspired primarily by Ynés Mexia, a Mexican-American woman who lived an extraordinary life and contributed greatly to scientific knowledge in this country. She does not appear in most science or history books and this play is my attempt to introduce her and her work to a wider audience. I want young audiences to know that there have always been women, especially Latina women, who have followed their dreams and accomplished great things, even if the wider world hasn't acknowledged them." The play was workshopped and presented as a rehearsed reading in April 2018 at the John F. Kennedy Center for the Performing Arts as part of New Visions/New Voices 2018. Our 7th & 8th graders enjoyed their first middle school dance of the year in our parish hall on Friday, September 28. Students from Nativity, Holy Spirit and St Bernadette Schools joined us as Mr. An Cao provided the music for the night as our DJ. 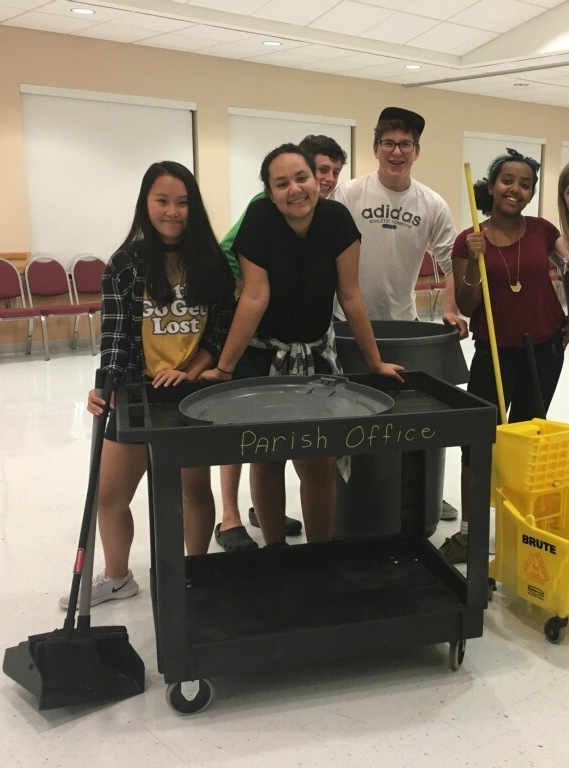 Our 8th grade Leadership Team members worked as the set-up and clean-up crews, assisting Mrs. Rowley, Mr. Burkhardt, Mr. Walsh, Mrs. Greshock and Mrs. Kiernan. Many 7th & 8th grade parents also donated snacks and chaperoned the event. Our clean-up crew earned high praise on a job well done from both Mr. James Thomas and Mr. Paul Moeller, our parish maintenance team. Pictured here are several of our 8th grade students hard at work: Janet, Mayah, Bethel, Luke, PJ and Delia. Thank you all for your service to our school! Please make sure to read the Buzz every week. There's a lot of great things in it. Also, please, send in YOUR submissions! Submissions are due by Mondays by 5pm. I accept submissions from teachers, staff, and parents. If you know of something interesting going on in our community, or want to give a shout out to someone at the school, I'd love to add it to the Buzz. I especially love pictures. Please contact Mrs. Rowley to make sure that we have permission to publish pictures of every student in the picture. Pictures need to be less than 5 MB. Thanks so much! - Look for coats to donate? - Sign up to decorate your trunk? - Sign up to sell Mixed Bag Designs?